I bake and cook gluten free because I am gluten sensitive/intolerant. I was sick for over ten years and being gluten free has been life changing. I consider it a blessing to be healthy finally! I have been gluten free for almost two years. My best advice for saving money while eating gluten free is to stock up when a food you use a lot is on sale and to look for coupons online before going shopping. In addition to sharing frugal recipes, I also share a way to save money every week on gluten free food. Is anyone else in need of a little chocolate? It has been kind of a long week at my house. My son is really ready for some outdoor time and we keep getting more snow. I don’t even know how much of the good stuff I have had today and by that I mean caffeinated beverages. My cabinets are looking kind of bare and I really didn’t feel like running to the store so I decided to make some flourless brownie bites. Not only do I love simple recipes but I also love it when they are affordable and let’s be honest, gluten free flour can be expensive. Yes I do hunt down deals on gluten free flour but still I try to be creative and bake without it when possible. So back to the chocolate… These brownie bites are rich and chewy. Enjoy! 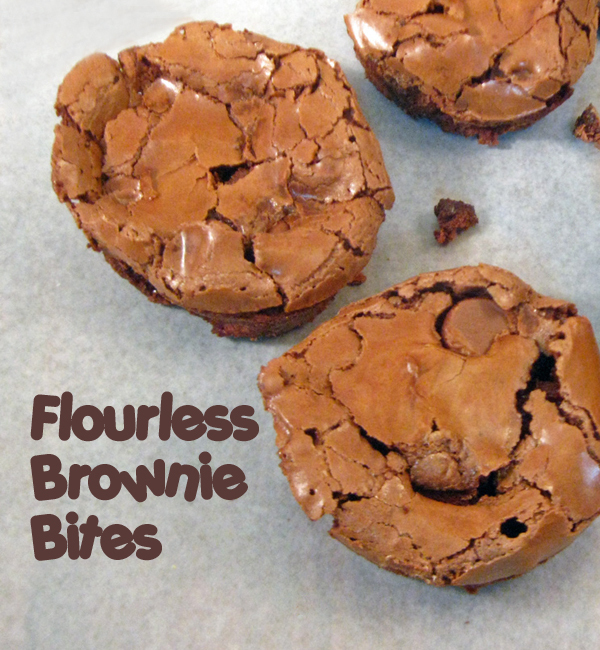 These brownie bites are rich and chewy. I stored these at room temperature in an airtight container. Enjoy! In a large bowl mix the powdered sugar, cornstarch, salt, and cocoa powder. Stir in egg whites. Blend together (the batter with be thick), then add in the vanilla extract. Stir everything until well blended and then stir in your chocolate chips or other add in. Spray a regular size muffin pan with a non-stick spray. Scoop the batter into muffin tray. I filled mine about ¼ way full. Bake at 350° for about 14-16 minutes, until brownies are puffed up and the top is glossy and starting to crack. Let sit for a few minutes in muffin pan before transferring to a cooling rack. This is a guest post by Nicole from Rolling Out Dough. Nicole is gluten intolerant and wanted to create a resource for saving money on gluten free food. She loves reading, finding a great deal and spending time with her husband and son. To get more easy affordable recipes, coupons and money saving tips please visit http://www.rollingoutdough.com/. You can also find her on Pinterest at http://pinterest.com/rollingoutdough/. These sound delish! My childrens birthday party is on Saturday, I am going to make these for the GF family members. I am sure I will eat a few myself. Thanks for sharing such a great recipe! So glad these are just in time for your party! Thanks for stopping by and commenting! This recipe from Nicole does look delish! These are awesome! Soo delicious! Ooh, how did I miss this post? I love all things flourless. Looking good and I’m going to check out Nicole’s blog! Just popped these flour less brownies in oven. Fingers crosed. Do you know how many this makes? 12 full size muffins? 24? I would love to make these for a pot luck but I can’t figure out how many it makes. Thanks!